Life insurance is a financial arrangement that works as an instrument of sustenance, recognizing the value of human life in its individual and social dimensions. It is a provider for social security and economic subsistence in adverse situations. Moreover, it works as an income protection measure for the family in case of the breadwinner's demise. Life insurance operates on the basic principles of sharing and pooling of risk among a larger number of people in a group. All modern and progressive societies have a well-developed and evolved insurance sector. In India, too, there has been a great leap in the volume of life insurance business. The Indian life insurance industry has had two major milestones in its development. The first being the nationalization of the industry in 1956, and the second recent one being the liberalization of the sector in 2000. The advent of multinational life insurance companies in India has led to many innovations in life insurance products, marketing distribution new concepts of internal risk management have emerged. The objective of this book is to arm the students / readers, wanting to pursue a career in the liberalized life-insurance industry in India, with essential working knowledge and practical details of life insurance provisions and practices. 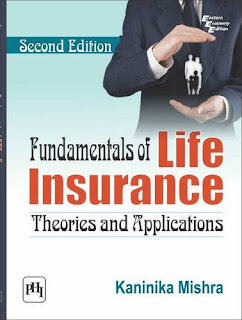 It provides the reader with extensive details about the background, the market distribution systems and the legal aspects of the life-insurance industry. The book includes practical examples and illustrations. These illustrations highlight some operating principles, contemporary practices, trends and important definitions. Several real-life examples and case studies have also been included for easy understanding of the intricacies and nuances of the business. As a taxtbook, it triggers the students to think, analyze and imbibe learning through thought-provoking review exercises. The book presents a holistic view of the entire life-insurance business enabling the student to become an effective member and associate of any life insurance organization. It is planned to be a complete one-stop solution for management students studying life insurance as a subject, or as a reference book for students pursuing studies in the related fields. I believe the readers will find this book interesting and useful.